At my church, my husband and I used to teach a class of twelve 11 & 12-year-old children. They recently split our class, and I now solo teach the 4 girls. I love teaching them. I also get to be their Activity Days Leader along with the 10-year-old girls. Needless to say, I have so much fun thinking of ideas to do with them. Now that I only have 4 in my class on Sundays, I can do more handouts and fun activities/crafts. I was at the store on Saturday, and last minute decided to do something in class for their mothers. I saw the M&M bags and thought, "Hey, M&M . . . that's kinda close to MOM." So I grabbed 4 bags and came home. After putting the kids to bed, I started up Photoshop and got to work. 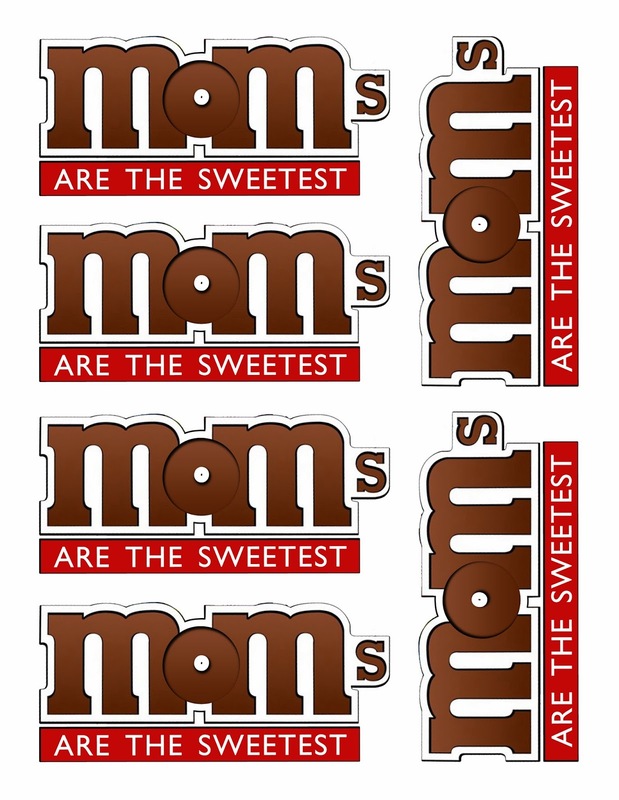 I made a cute little MOM M&M label. Guess what, I making it available for free download. *UPDATE: I have changed the file from the one pictured in use above to the accurate MOMs without an apostrophe. The file is available for download by clicking on the image below. Enjoy! It's a free downloaded printable from Over the Big Moon. 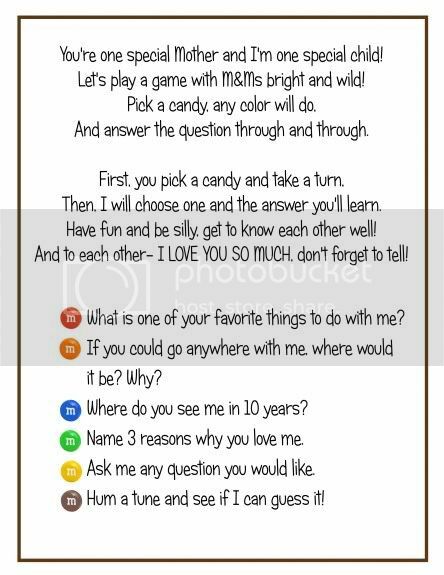 It's a game for children to play with their moms while sharing a bag of M&Ms. The girls in my class packaged up their MOM bag of M&Ms with a printed copy of the game, tied it up with a little card they wrote. They were all so excited to share their gift and fun with their moms. Hope you all had a great Mother's Day! This is so cute!! My sister and I have a blog over at welovebeingmoms.blogspot.com and I plan to share it their in hopes to direct more traffic to your site. Thanks for sharing....so cute! Thank you for sharing! Love it! Will use it with my MOPS (Mothers of Preschoolers) Group. Tried to download the M&M bag cover for my grandsons to use for their mother. Why can I not download only the graphic without the mediafile program file? What a cute idea. Hope you don't mind me featuring them on my blog tomorrow. I'll link back to you of course. This is a great idea, and very cute. Just please delete the apostrophe at the end of "mom's"
hah. cool MM's for mom. Can you make this editable? I don't think the apostrophe should be there, just an S. I love the idea and would like to use it for Mother's Day, you are very creative! Very cute! Thank you very much!!! Cute, but there shouldn't be an apostrophe. Low cost Mother's Day or new mother gift. Thanks. I teach 3 and 4 year old children and also children at my church. I found this and would like to save it for future use. Is that alright with you? I will not sell it. Did you print these on a sticker page or how did you get them to stick? Do you print these on sticky paper or how do you get them to stick on the m&ms? 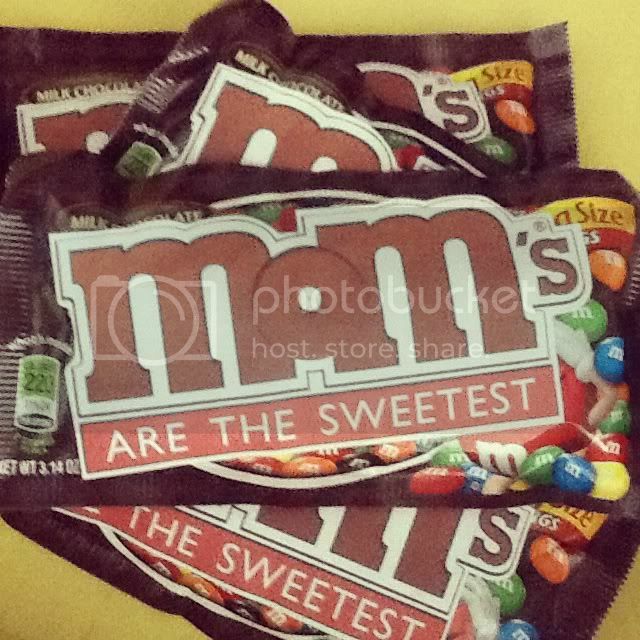 Does your template work with the mini bags of M&Ms or the regular sized ones? Thanks! Thanks for sharing this idea. I just wish you would post it as a pdf link on your site instead of having us jump through the hoops of downloading yet another program that doesn't work. I would love to use this as part of a roundup I am putting together. I would use a small picture as part of a collage and then a link to this post. Please let me know if this is something you would like me to do. Thanks a million! This is really so cute gift idea for all Mom's. Thanks for Sharing the idea!